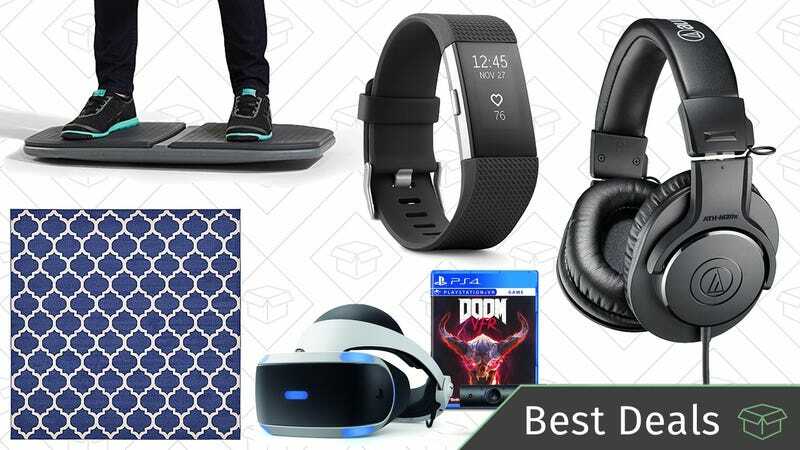 Fitbits, PlayStation VR bundles, and a massive Amazon rug sale kick off Sunday’s best deals from around the web. For all of the best President’s Day sales on apparel, beauty, and more, head over to this post. The new version of Samsung’s Gear IconX—their answer to AirPods—are only a few months old, but they’re already $40 off for President’s Day. Use them as truly wireless earbuds with any phone, or load songs directly onto their 4GB of onboard storage, and enjoy your running playlist untethered. Other than a 2-pack discount, we’ve never seen a deal on Amazon’s Echo Show, until today. Get the touchscreen-equipped Alexa device for just $150, if you don’t mind a certified-refurbished one (though, how much could be done to it, if it’s not even a year-old device). You can read Gizmodo’s review if you want to learn more, but it turns out Alexa would have benefitted from a visual component all along. Yes, you can buy rugs on Amazon, and hundreds of highly rated options from Unique Loom are on sale in today’s Gold Box. Area rugs, square rugs, runner rugs, round rugs. Rugs! There’s such a wide assortment of sizes, colors, and styles, that you should have no trouble finding something to suit your decor. You’re not a true citizen of the internet until you’ve bought a mattress online, sight unseen. A bunch of different options are on sale from Signature Sleep and Novogratz in today’s Amazon Gold Box, including the typical hybrid foam mattresses, plus pure memory foam options, and even old-school coil springs. I wish this sale had been earlier in the winter, but you can still enjoy your outdoor space on the tail end of the cold season with this highly rated patio heater. Today’s $157 deal is an all-time low by over $25, but it’s only available today, and could sell out early. There’s no easier way to make your bathroom feel like a spa than adding some bamboo stuff. A shower bench and bath mat are both on sale for some of the best prices ever on Amazon today, but the cucumber slices and face masks are sold separately. Despite what door-to-door salesmen might tell you, you don’t need a full set of knives. You can breeze through about 99% of kitchen tasks with just a few important blades, and they’re all included in this discounted 4-piece set. The chef’s knife is one of our readers’ five favorites (it’s also on sale separately for $31), and has long been the best value in kitchen knives. The paring and bread knives are pretty self explanatory, and while you could probably get away without owning a utility knife, it is a little more maneuverable than the chef’s knife, and it’s good to have one for chopping vegetables if you’ve been using your main knife on raw meat. For one day only, Amazon’s running a big sale on Kindle biographies and memoirs, with every title available for $4 of less. Options include Katy Tur’s front row seat to the 2016 campaign, Tina Fey’s Bossypants, and a lot more. If you have a 4K Blu-ray player (or just an Xbox One S or X), you can relive all three of Chris Nolan’s grim and gritty Batman movies in beautiful 4K for $70, an all-time low.